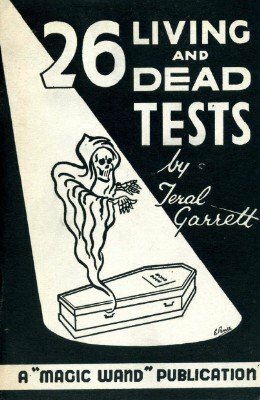 A collection of twenty-six of the best Living and Dead Tests. Indispensable to the mentalist and providing a wide variety of routines suitable for performance under every possible condition. A well performed Living and Dead Test can create intense emotions. Please use these effects responsibly. Many of the effects described can be performed one-on-one, in an intimate close-up setting or for a large audience. Several ingenious methods are described. I find the one of method 26 the most clever one. It would sell like hot cakes as a single effect miracle on a DVD for $39.50. I was even tempted to remove it from the ebook and keep the secret all to myself. But you can learn it here together with 25 other methods to divine the living from the dead. The ebook is split into two sections. The first one deals with methods to identify the slip or envelope with the dead name. The second one deals with methods where not just the slip is found but also the name of the dead person is divined. Experience has shown that Living and Dead Tests have an appeal all their own. There is something fascinating and mysterious in the discovery of the dead name from among the living, especially when the names written are those of friends and relatives whom the performer cannot possibly know. It has been suggested that the use of dead names may cause embarrassment if a recently bereaved person is at the party, dinner or whatever the function may be. Personally I do not agree with this attitude for, having come against this situation myself I can assure the reader that the person concerned—should he, or she, be selected to write the dead name—will be even more mystified and, more often than not, will corner the performer after the show to discuss the mysteries of mentalism and spiritualism. However, if the reader feels squeamish on this point he may adopt Stewart James' suggestion and use the names of SOUR and SWEET objects, or he may think up any number of combinations of OPPOSITES, such as MALE and FEMALE, etc., for this purpose. 1st edition 1942; original 29 pages; PDF 20 pages.